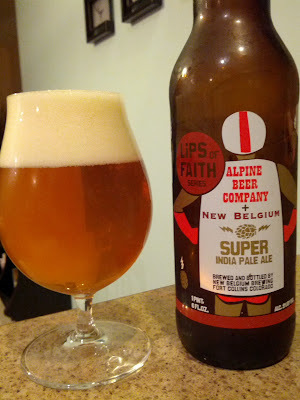 Brewery: New Belgium & the Alpine Beer Co.
Beautiful golden brown color with plenty of fluffy white head. I love this color. Strong aroma of fruity hops even from a few feet away. Lots of citrus, pine, fresh cut grass fills out the hop aromas in the foreground. There is the slightest hint of bready malt in the background of this delightful aroma as well as a tiny bit of alcohol. The taste is just great this is a top notch IPA. Super hop bitterness mixed in with pineapple and pine resin flavors and the tiniest amount of sweet caramel malt. Medium bodied mouth feel with almost no carbonation. This is a fantastic beer that I highly recommend picking up if you get the chance. But that chance is limited and you gotta get over to Indiana to get it so get in your car and drive!